Of course, these are broken even further down into survey, focus group and interview questions. For the past few weeks, I’ve been busy setting up the project. An overall and a detailed schedule are safely kept on my computer and in my planner and constantly consulted to make sure I’m not falling behind. A ton of books in the library have been plowed through to make sure I’m approaching the issue correctly and using research methods properly (the bibliography is here). This proved valuable – helping me add another critical question into my research: Are IELTS scores a guarantee for a language-barrier-free transition into an Australian education and social life? Questions for the focus group and interview are prone to changes based on findings from the survey; however, I have made the most out of the break, setting up my blog and finalising the survey questions – It will be out next week! Find me at dmad920@uowmail.edu.au and on my Twitter @thespecsofMia. 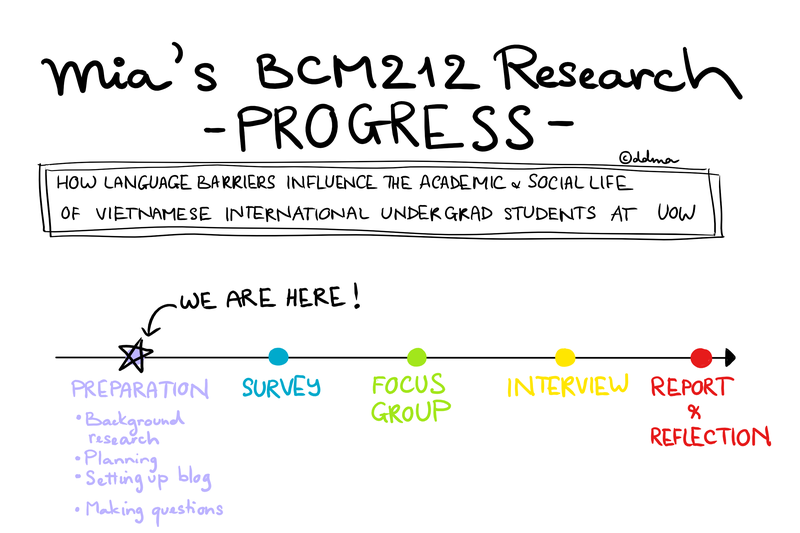 This blog is the main platform for me to update you on my progress, everything can be found here (or you can scroll up to the menu bar, hover your pointer over UOW and click on BCM212). Better yet, hit (found at the end of this page/at the top of the column on the right of the blog) and an email will be sent to you whenever a new post is up! Thank you for your participation in my research and really hope that you’d stick with me all through this project!